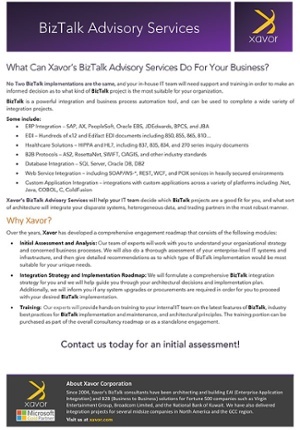 What can Xavor’s BizTalk Advisory Services Do For Your Business? No two BizTalk implementations are the same, and your in-house IT team will need support and training in order to make an informed decision as to what kind of BizTalk project is most suitable for your organization. BizTalk is a powerful integration and business process automation tool, and can be used to complete a wide variety of integration projects. Xavor’s BizTalk Advisory Services will help your IT team decide which BizTalk projects are a good fit for you, and what sort of architecture will integrate your disparate systems, heterogeneous data, and trading partners in the most robust manner. Initial Assessment and Analysis: Our team of experts will work with you to understand your organizational strategy and concerned business processes. We will also do a thorough assessment of your enterprise-level IT systems and infrastructure, and then give detailed recommendations as to which type of BizTalk implementation would be most suitable for your unique needs. Integration Strategy and Implementation Roadmap: We will formulate a comprehensive BizTalk integration strategy for you, and will guide you with regards to your architectural decisions and implementation plan. Additionally, we will flag to you whether any system upgrades or procurements are required in order for you to proceed with the desired BizTalk implementation. Training: Our experts will provide hands on training to your internal IT team on new features in BizTalk Server, industry best practices for BizTalk implementation and maintenance, and architectural principles. The training portion can be purchased as part of the overall consultancy roadmap or as a standalone engagement.